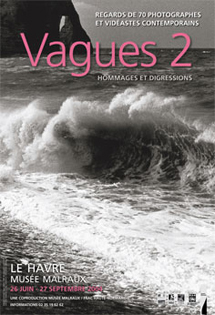 After "Vagues 1. Autour des Paysages de mer de Gustave Courbet" presented in the spring of 2004, the Musée Malraux, in cooperation with the FRAC Haute-Normandie, brings the public the second instalment of a major exhibition on the theme of the wave, "Vagues 2. Hommages et digressions". Starting with the acquisition of Gustave Courbet's The Wave, painted in Étretat in 1869, the first exhibition showed the development of this motif in painting and photography throughout the second half of the 19th century. This theme proved to be a real challenge at a time when art, science and technical progress were closely linked. Science would soon provide a better understanding of this complex physical phenomenon. At the dawn of the 20th century, technical advances in photography and film gave humans the means to break down and reproduce the movement of the wave. And then? The acquisition by the FRAC Haute-Normandie of a photograph by Swiss artist Balthasar Burkhard, Wave, taken in Étretat in 1995, in tribute to Courbet and his "seascapes", raises questions about the posterity of this theme in the 20th and early 21st centuries. The technical means available to artists have evolved considerably. Photography—whether colour or digital—and video provide a wealth of possibilities and open up endless new fields of experimentation, as artists take more and more liberties with the theme and create their own sea or storm as needed. The "new wave" is matter, surface and energy. The seaside is peopled with Venuses, little mermaids and surfers, with strange objects that bring it to life. Viewpoints are multiplied and enriched with scientific images and experiments that show the sea in a new light (scuba diving, journeys to far-away places, etc.). More than 70 photographers and videographers, from the 1920s to the present day, invite us to view the ocean, its waves and the play of water in general. The sea reveals its fascinating appeal and the vast freedom it affords. Nearly 120 works carry us by waves into a water dreamland of homages to Courbet, encompassing seascapes and early photography to digressions and fantasy.